We love our small travel trailers here at Van Clan, but sometimes it’s healthy to take a step back and think about all of choices that we so fortunately have. We love the freedom, the space, the noise of nature, and cooking outdoors underneath the stars with some of our top cooking accessories (everyone loves a good utensil, but they’re not technically gadgets so we don’t feel bad mentioning them) so having the right small travel trailer means a lot to us. 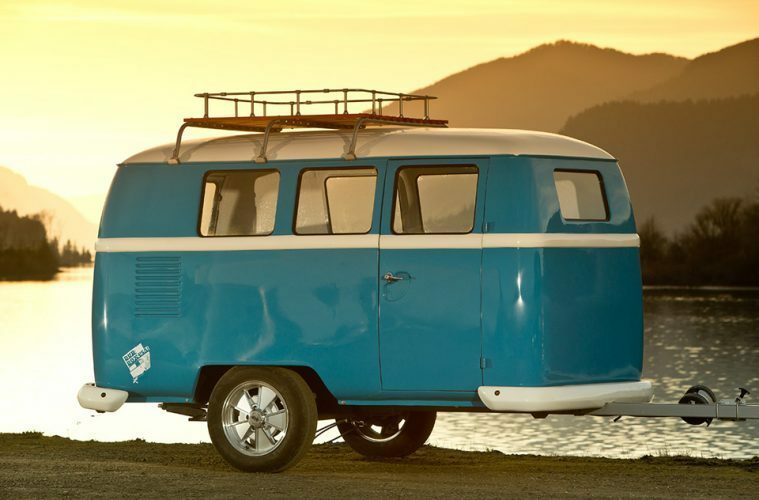 Most of the campervan conversions that we cover cost the earth and are big behemoths or vintage weekend beauties, but thanks to the surge of affordable small travel trailers on the market we can bring you some cheaper alternatives that will allow you to live like an off grid god. These go in no specific order. 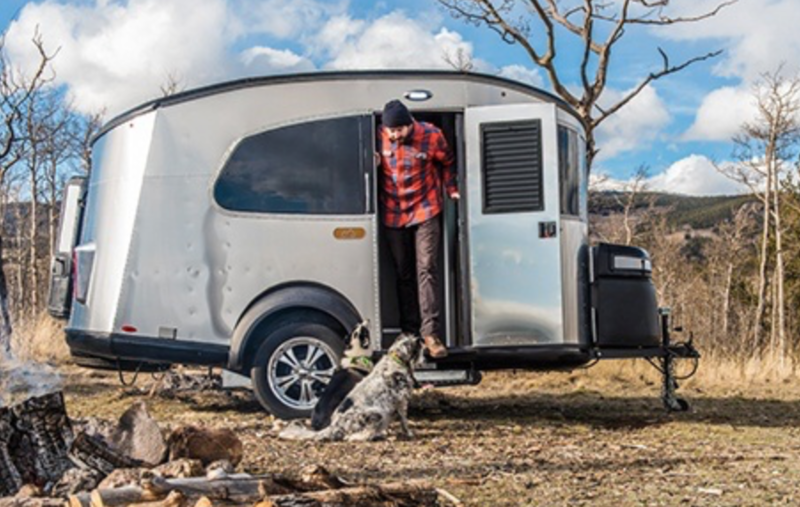 Finally theres a breed of small travel trailers on the market that will get you off grid without draining your bank account of all of that precious gold. 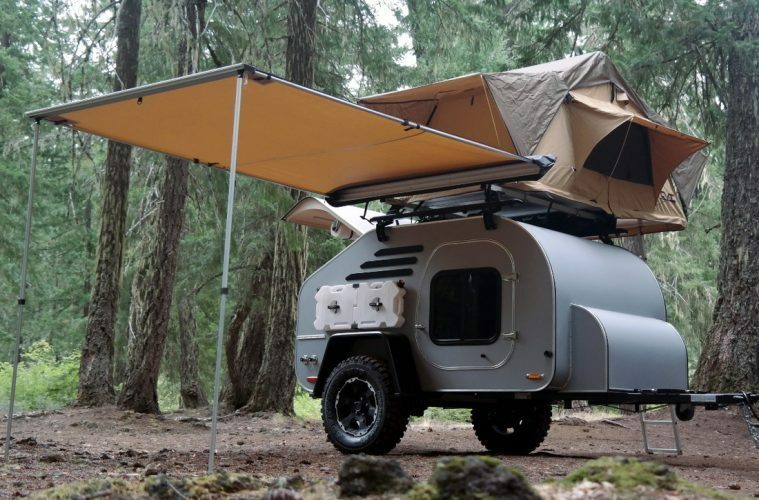 If you’re looking for an all out adventure off road teardrop camper then this won’t be for you, but if material things don’t sway your decision in where and how you camp then this could be the solution that you’ve been looking for. 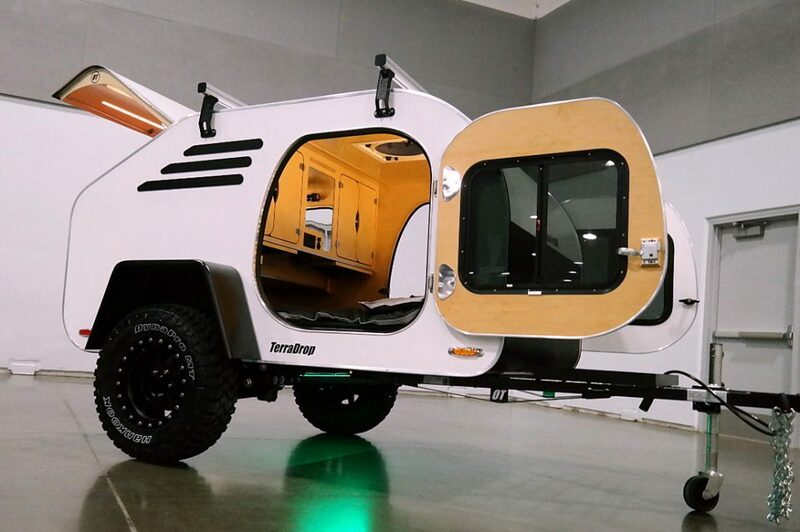 Meet the Cargo Camper, a small off grid home created and built by Texas-based company Cargo Camp. It’s clean, fresh and functional, and the perfect home from home if you’re solely focused on experiencing the world around you. With LED lighting and USB sockets as standard it has the bare minimum that you need to keep yourself going whilst on the trail – minimalistic living is the future! What’s Inside This Small Travel Trailer? Once you step inside the shiny aluminium trailer you’re greeted with everything that you need for comfy off grid living. Theres a wooden table with two bench seats that’s big enough for you to eat your dinner at or play some board games in the evening, and when you’re done eating you can take the table down and fix up your bed for the night. It might not be memory foam or four poster, but it would certainly be comfy enough for us to have a good night sleep on – if you’ve been adventuring hard then you should be tired enough to fall asleep standing up! Theres enough storage for you to stick some food and dry clothes, and the plugs are easily accessible and not in hard to reach places. Light comes in from the large entrance door and the two extra windows, so you don’t need to use your batteries until night time. Just looking at this makes us feel sleepy. After a hard day on the road this looks like the perfect place to get some shut-eye. Speaking of batteries, you can also purchase a solar package to add on and an external generator, and if you want to hook up to the mains then all of the necessary cables and connectors come as standard. 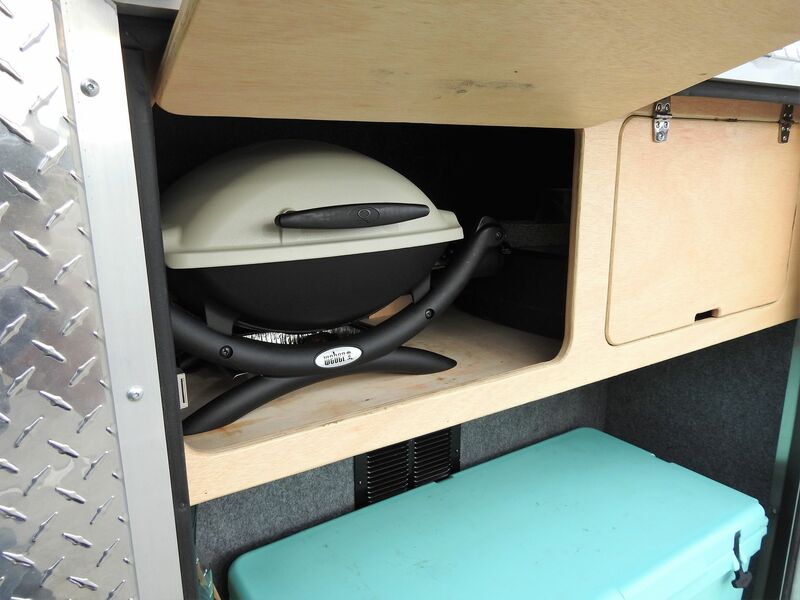 There’s enough space for you cook in the main living area if the bed is down (if you have something like the iKamper EatOut to hand for example), but once the back hatch lifts up theres enough space for outdoor cooking plus storage for your burner and coolbox. You can add a fridge freezer package if you have some extra money to hand, but this article is about owning a budget trailer camper so you’re going to be cooking fresh food and not frozen goods – get creative! Not many trailers or campers come with an awning, but this budget trailer camper comes with one as standard! It turns out that you actually get a lot for your money, and speaking of money lets get down to how much everything costs! Is This Budget Trailer Camper Really $7k? You better believe it is! The smaller 5′ x 8′ model pictured above weighs in at $6,750, and the larger 5′ x 10′ unit is priced at $7,000. We DEFINITELY think that you should consider buying this budget trailer camper, because when it boils down to facts and figures the word ‘budget’ only applies to the price. 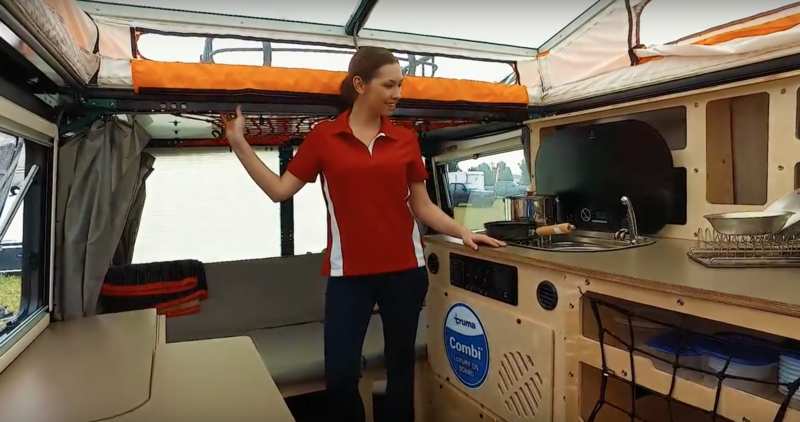 This trailer has lots of the features, fixtures and fittings of campers that cost twice as much as the Cargo Camper, and it’s built well and made to last. 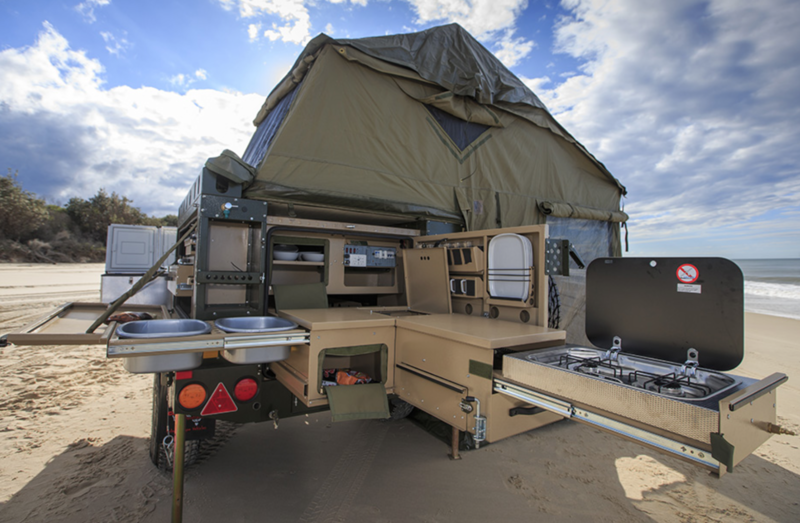 It’s a rugged camper that can withstand harsh conditions and is more than capable of reaching those gnarly off grid hot spots. 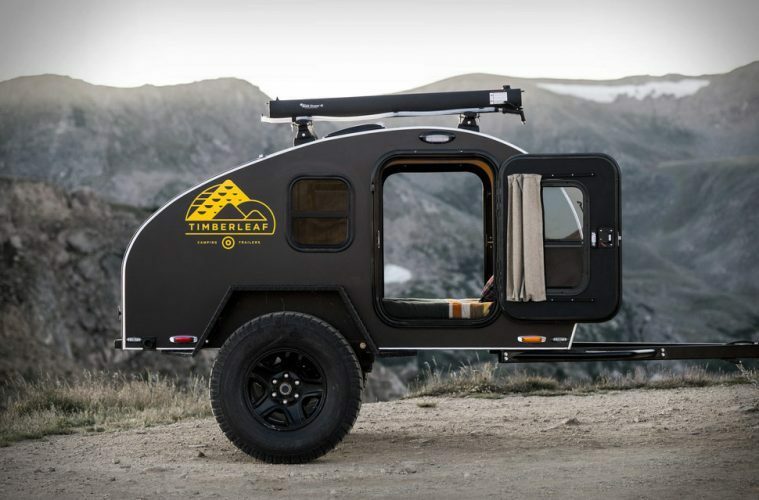 Whilst the Cargo Camper is one of the small travel trailers in our list with no frills, bells or whistles, the Timberleaf Pika is a small travel trailer that comes with some off grid comforts that you really can’t afford to live without. For a small increase in price you can get a lightweight, two person adventure trailer that is as much at home on mountain roads as it is trundling down the motorway.The Timberleaf Pika provides us with more proof that good things come in small packages. 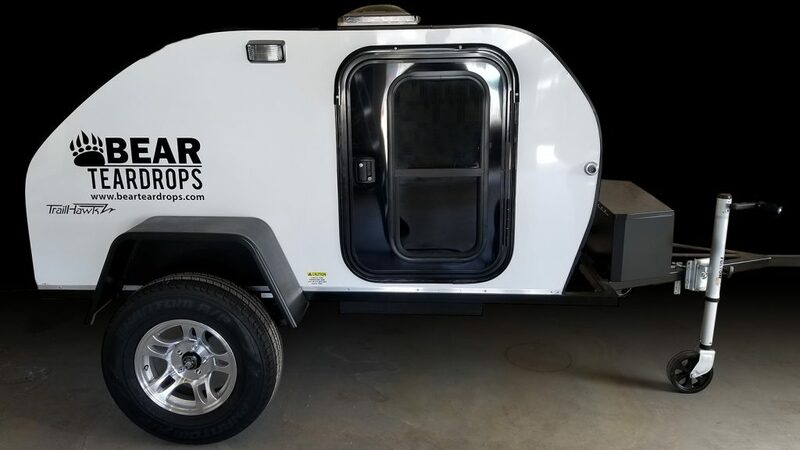 It weights in at 1025lbs, meaning that if you’re eco conscious and use one of our top eco campers rather than the gas guzzling EarthRoamer then you’re still going to get a lot of miles for your money. It’s designed to be a smaller, lighter and more compact option to Timberleaf Trailer’s classic teardrop trailer, but that doesn’t mean that it compromises on comfort or durability – small travel trailers get the job done! There’s a couple of different packages that you can buy, and this entry in our list of small travel trailers has some amazing additional extras that you can add on as and when you feel like it. The gnarly Off Road package will not disappoint the hardened adventures in the Van Clan Off Road community. It features Timbren Axleless suspension with a 4″ lift, rock armour, 33″ BFG All-Terrain tires (that’s not the Big Friendly Giant that steals dreams by the way, in case you were confused), electric brakes and a Max Coupler articulating hitch. In English; you can take this off grid trailer wherever you damn well please! When we first read the name of this trailer we couldn’t see any similarities to the little yellow Pokemon that all know and love/hate with a passion. 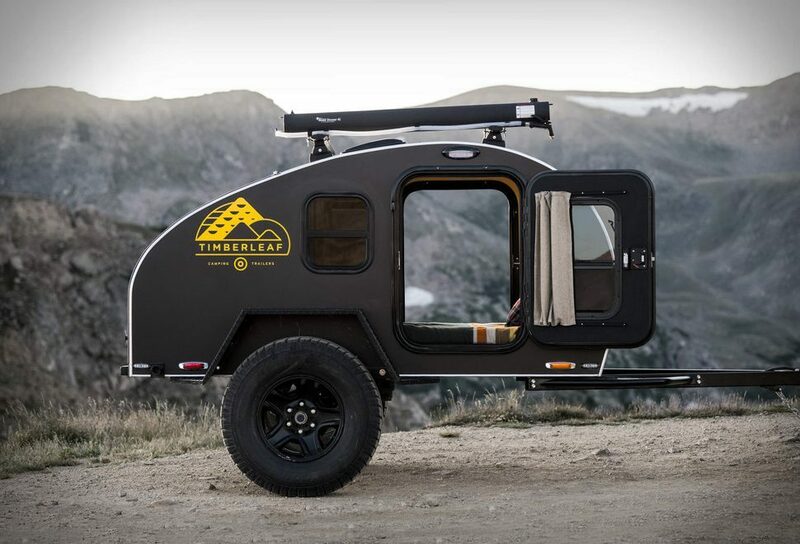 It turns out that Timberleaf haven’t named their custom small travel trailers after an electric mouse; it’s named after a small breed of mountain rabbit called the American Pika, a daring and speedy little species that spend their time traversing rocky terrain and living off the grid. Now it all makes perfect sense! 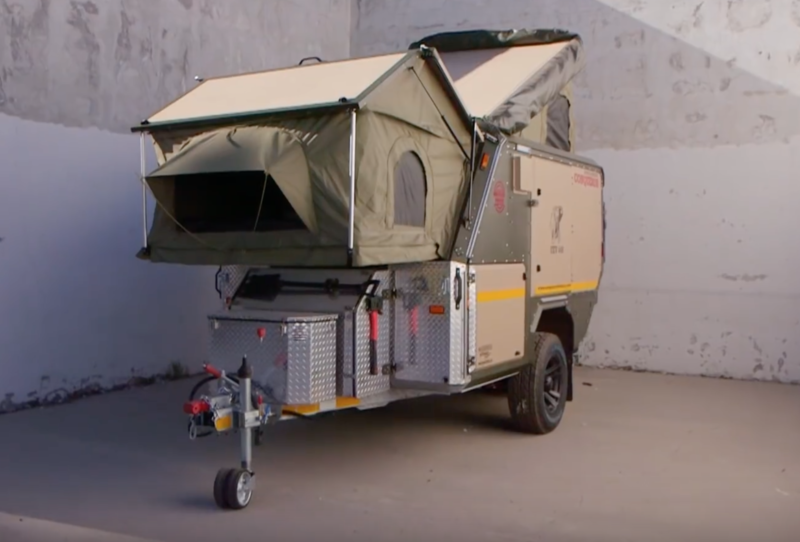 The Pika off grid trailer might not look soft and fluffy on the outside, but it’s comfortable and cosy in all of the right places and will keep you warm and dry on those dismal days. 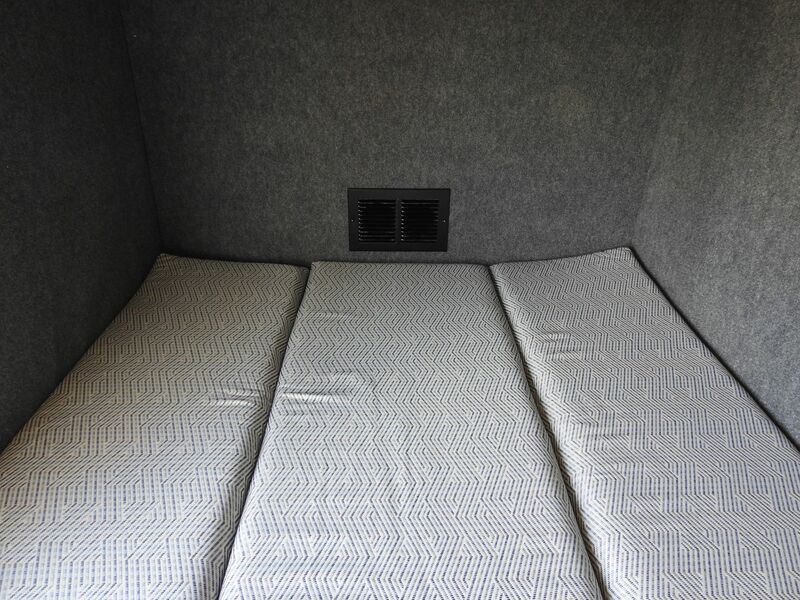 There’s a 4″ thick double mattress on the inside for those cosy nights in watching the sun go down, and large netting pockets provide you with lots of space to store your gadgets, maps, books and torches. There’s an insulated roof with a a cabin fan if it gets too hot, and seven bright 12v LED’s provide enough light for you to comfortably see at night time. The large tinted polycarbonate skylight lets you look up at the stars whilst you drift off to sleep, and theres also a slide back cover if you want to turn off your alarm and sleep in – even adventurers like a lie in every now and again! Does These Small Travel Trailers Have Their Own Power? They sure do! The Timberleaf Pika comes with a Power Centre that would make the Death Star look like a wind up toy, and you can use it to manage all of the 110V power, converter and 12V battery power. 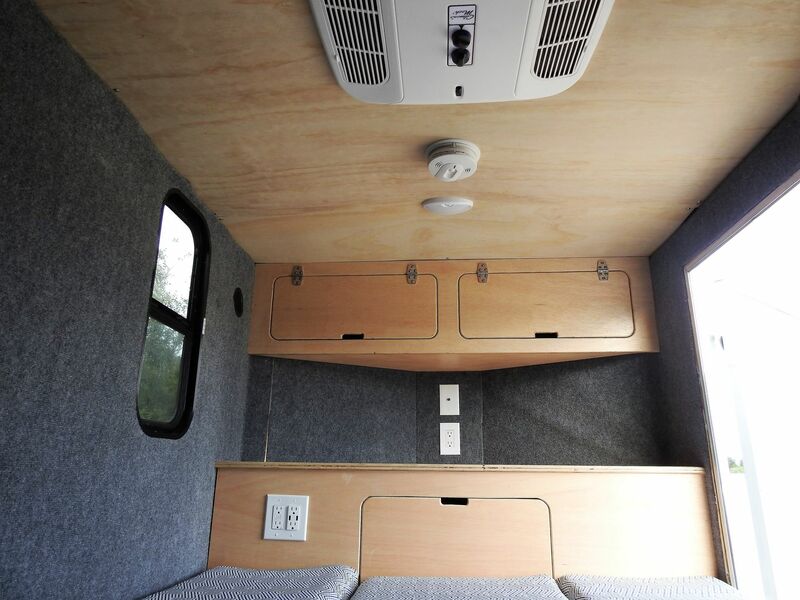 This small travel trailer comes with a 100 amp-hour deep cell marine battery, which in turn powers six USB power outlets, two 110v GFCI outlets and one general 12v charger. If you’re a digital nomad on the road then theres no need to worry about your devices running out of juice – the Pika lets you work, rest and play all in one day! Solar panels, lockable storage boxes, roof racks and outdoor top cooking accessories can all be added as optional extras if you have a little bit more money to burn, though it will all depend on how much time you want to spend in your off grid trailer and how often you plan to use your teardrop camper. Gas props lift up a rear hatch if you want to cook out in the open, and the 35L fridge will make sure that your perishables stay ‘un-perished’ until you decide to chow down on them. These small travel trailers costs $11’750 (£9111.89) which isn’t a great deal more than the Cargo Camper. It’s a steal and a major lightweight alternative to some of the other bulkier trailers on the market, plus it’s a very viable option if you don’t like the faff of putting up pop up campers. We would definitely recommend spending the extra money on solar panels so that you can stay off grid for a lot longer, but if you’re just after a little weekend getaway camper then the base model should be perfect – weekend warriors and small travel trailers are a great combination! Like what you see? Check out the Timberleaf Trailers website for more information on the Pika! 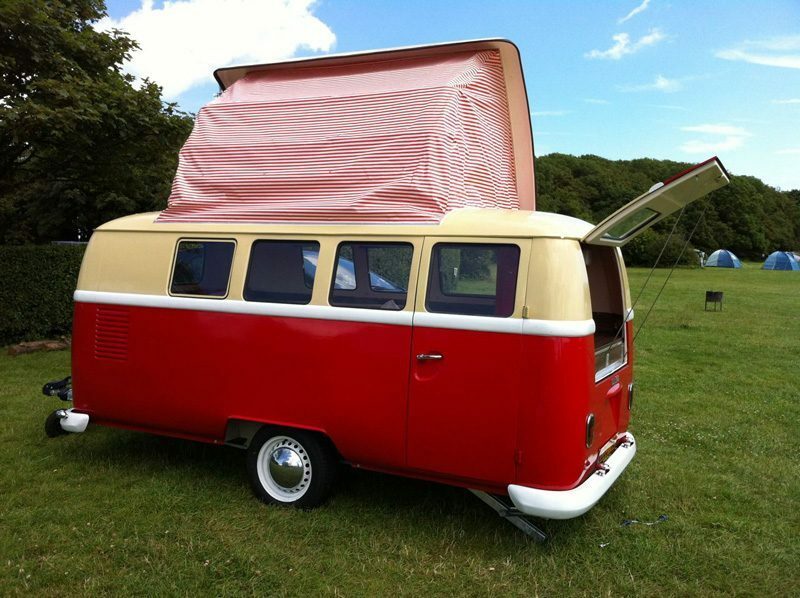 What’s Inside The Dinky Dub Camper? These small travel trailers is designed to be as smooth and as lightweight as possible, so you won’t have a hard time towing it down those rough country lanes. 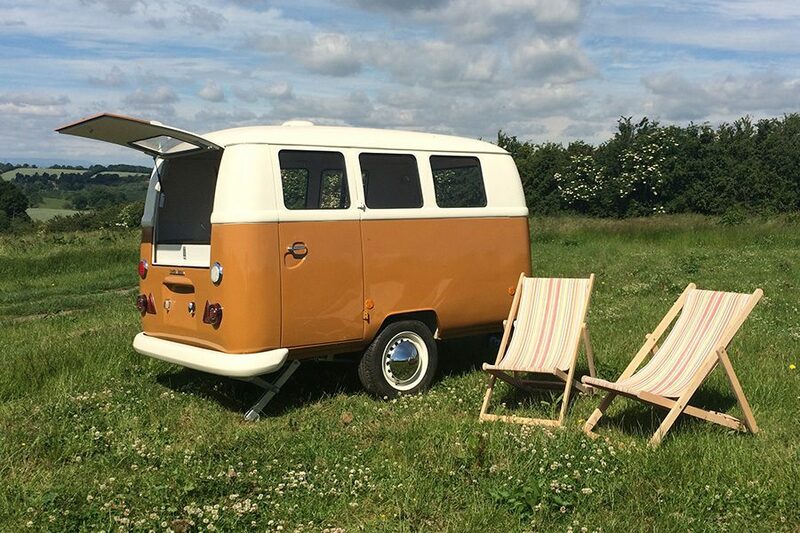 The range of choice in flooring, blinds, upholstery, cupboards and even worktops ensures each Dub Box is as individual as their owners, so you can make your own Dinky Dub Camper as weird and as wonderful as you! From Dinky Dubs to a Praying Mantis, we’re really proving that small travel trailers come in all shapes, styles and sizes. This is the first of our trailer campers to have more of an edgy and less lightweight look, but don’t be fooled by appearances. We guarantee that the Taxa Mantis Trailer by Taxa Outdoors will fit all of the criteria for an off grid range of small travel trailers whilst not being a nightmare to set up! 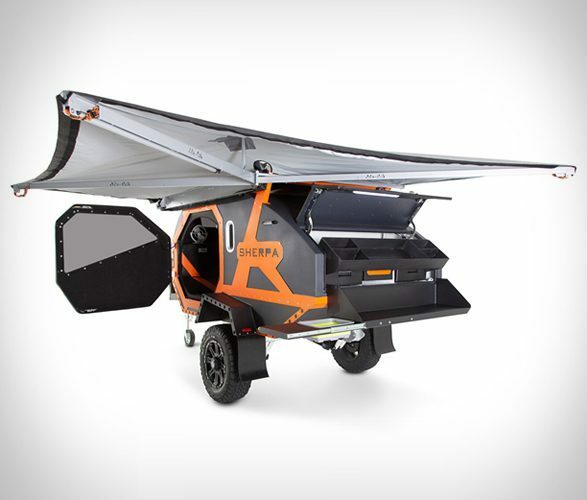 Here it is, the Mantis Adventure Camper from TAXA Outdoors. 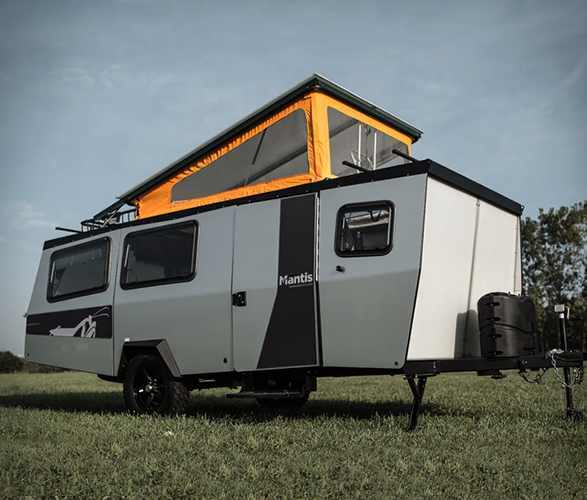 With its cool steel exterior, Praying Mantis logo and distinctive orange pop top it certainly looks like the adventure camper that we’ve been dreaming of. These small travel trailers are super lightweight, coming in at under 2,300 pounds and measuring at a whopping 18-feet-long! You’re going to get a lot more room in this than in some of the the other trailer campers, but you’re probably going to have to have a practice towing this before you set out on the road. TAXA say that there’s enough room to comfortably sleep four adults (or three and one dog if the picture above is anything to go by! ), and enough room to do athletics and yoga too – 18 feet is huge! 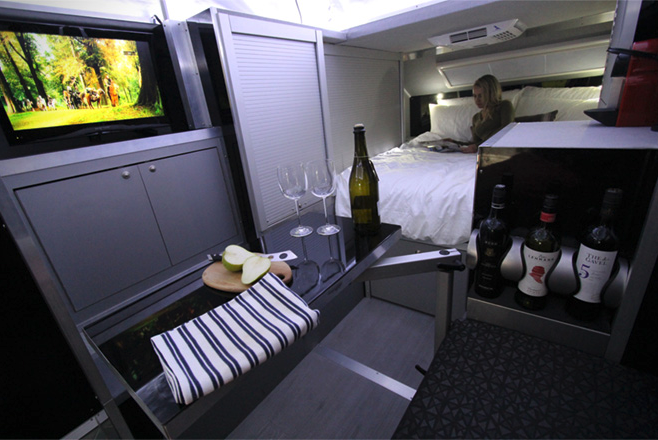 First impressions are that theres definitely plenty of room to live comfortably in it without feeling cramped. It might not be as homely as the Pika on the inside, but it more than makes up with it with its space saving ideas. What’s Inside This Off Grid Legend? 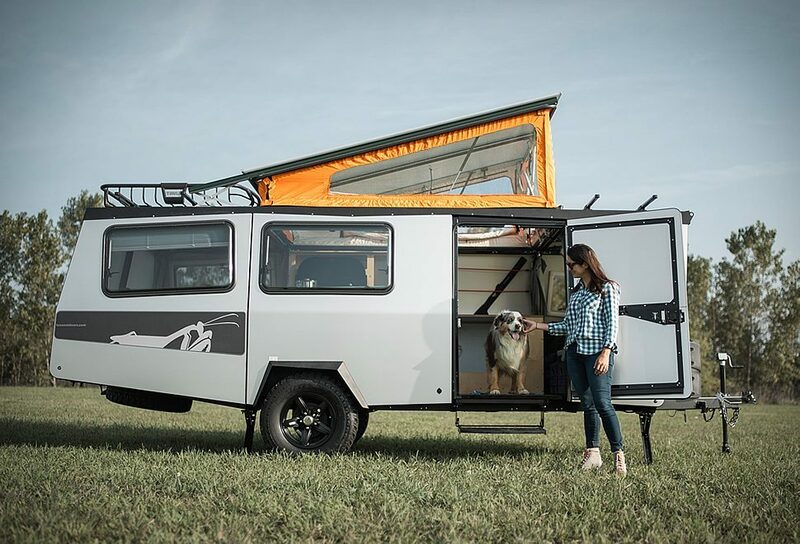 We’ve already said that one of our pet peeves is not being able to stand up in a camper van or trailer, so we’re super stoked that this Taxa Mantis Trailer has a pop top for extra headroom and extra light. 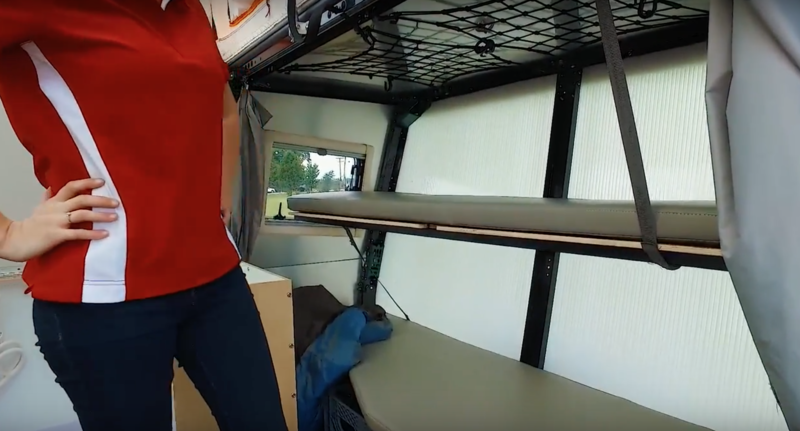 It makes a huge difference when you’re away for a long stint living off grid, and the bright orange fabric means that you won’t miss your small travel trailer in a crowd! There’s a queen-sized bed for two adults which can be converted into a couch, as well as two adult-sized bunk beds at the front. Other bits and bobs that might interest you are the integrated plumbing and electrical system, a wet bath to keep clean on the go, a fully-equipped kitchen with all of the equipment you might need to whip up a proper meal, plenty of storage space, and a Thule cargo deck and rack on the roof for those bulky items that you don’t want stuck in your living area. The wet room is a pretty cool addition, and it all stores neatly away in this waist height box so it’s out of view during the day. You’ve got your toilet and shower area all in one small space that’s totally wide enough for you to go about your business but doesn’t take up too much space – it’s as wide as the kitchen unit to give you a general idea. Plus the flip down lid probably turns into a space rocket or a triple decker bunk bed – the Mantis Trailer really does make the most of every inch of space. It’s clean, it’s as rugged as Tom Sellick’s moustache, and its as light as a trailer sized feather. All in all it’s an awesome bit of kit. We managed to track down one of these small travel trailers online for £24k, which considering how much space you have and the amenities include inside is pretty good value. The price might be starting to creep up as we get through this article, but we’re starting to see more and more additions and off grid extras that make alternative living a lot easier. 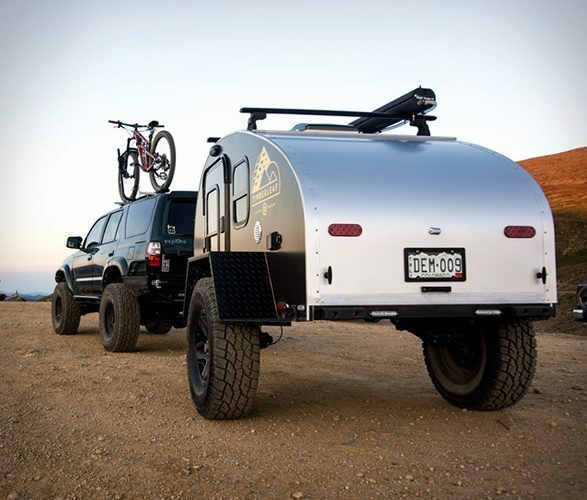 Without further ado, let’s check out a teardrop trailer that was purpose built to conquer any terrain. 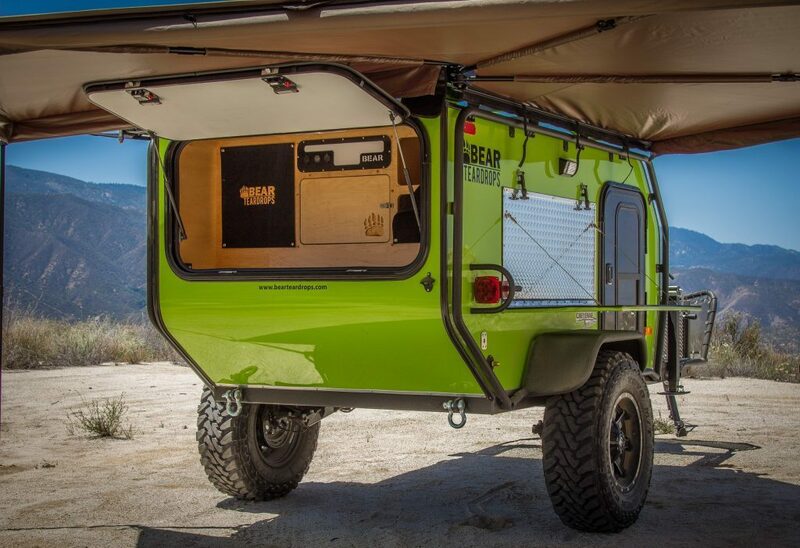 Mark Weseloh launched Bear Teardrop Trailers with a specific mission in mind; he wanted to create a small trailer travel that could be towed into the unknown by everyone from first time travellers to weathered weekend warriors. 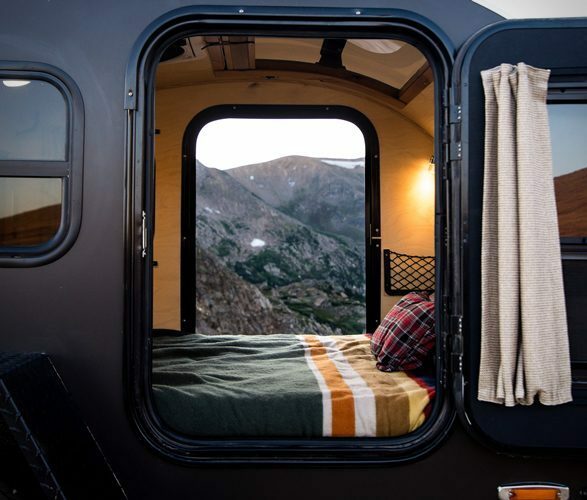 These small travel trailers appeal to both part time campers and vandwellers alike, and are as much at home in your local national park as they are in the rocky mountains or traversing deep ravines. 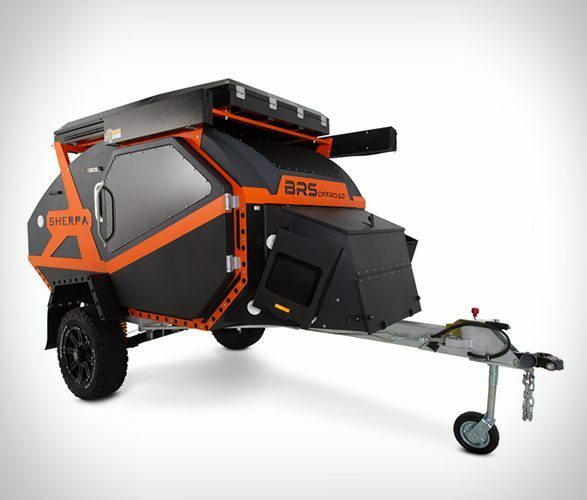 Could Bear Teardrop Trailers be the best small travel trailers ever? The trailers are designed to be extremely comfortable without going overboard on unnecessary features (we’re back into minimalistic adventure mode) but they still have everything that you might need to live like royalty in the wilderness for several days at a time (and even more if you’re used to living in small spaces long term!) This school of thought keeps Bear Teardrop Trailers light, easy to use and adaptable to the customers needs. The company has two flagship models. The Trail Hawk (such a cool name!) from Bear Teardrop Trailers can accommodate two full sized adults or one adult and a small pack of dogs, or a large bear and a small hawk (ok that last one was made up…or was it?) The beauty of these small travel trailers lies in the simplicity of the design; it’s built on a powder coated steel frame with Timbren Axle-Less suspension so it’s extremely durable and made to work well under stress. 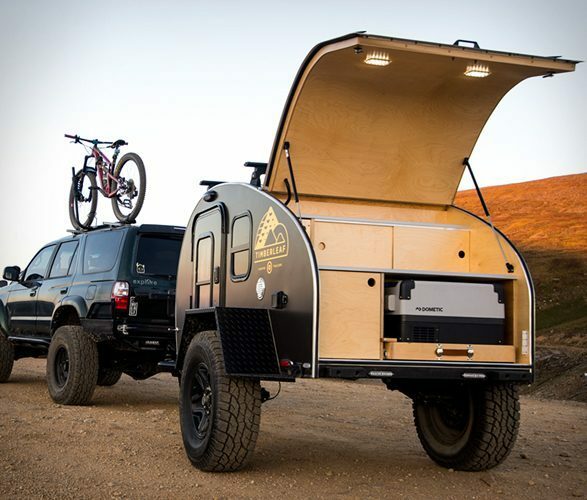 These small travel trailers have ample storage and a battery compartment to keep your gadgets geared up when you’re out on the trail. 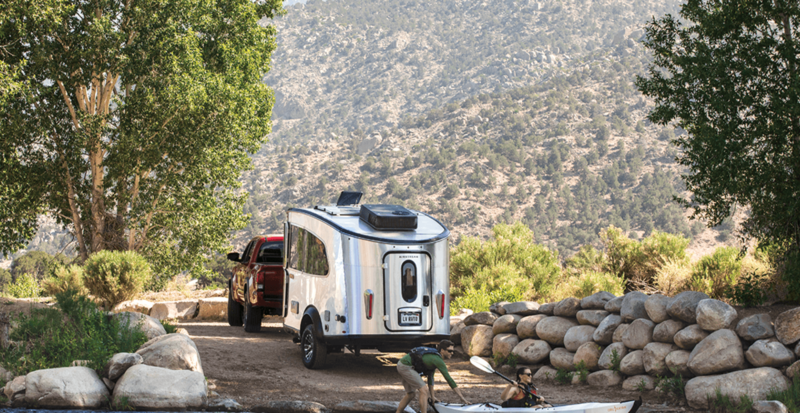 This teardrop is so light that you won’t even notice that you’re towing it behind you, meaning that you could easily pull it behind a small day vehicle like your every day commuter car or something like the Ford Transit Camper. The major limiting factor for most teardrops is their off-road capabilities, with the campsite usually being the best place for you to pitch up in rather than the deep depths of a mountain forest. 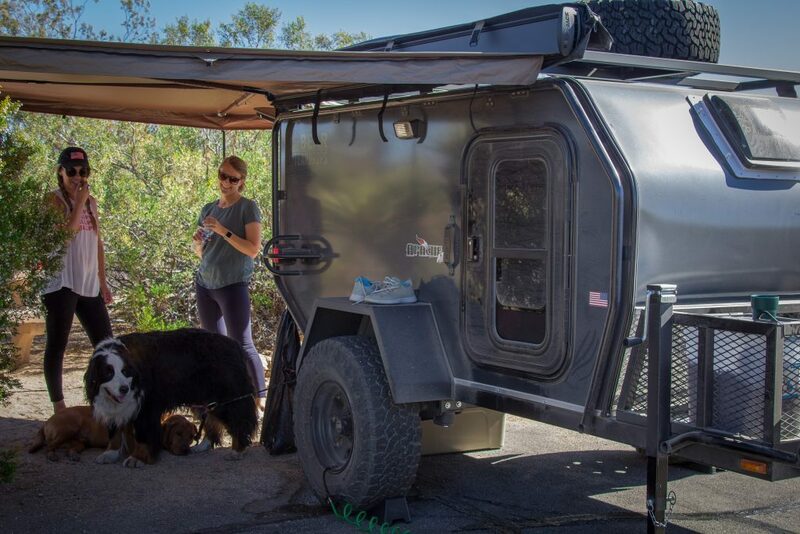 Both Bear Teardrop Trailer models come with great clearance, all-terrain tires and are made to handle well on highways and adventure courses alike. 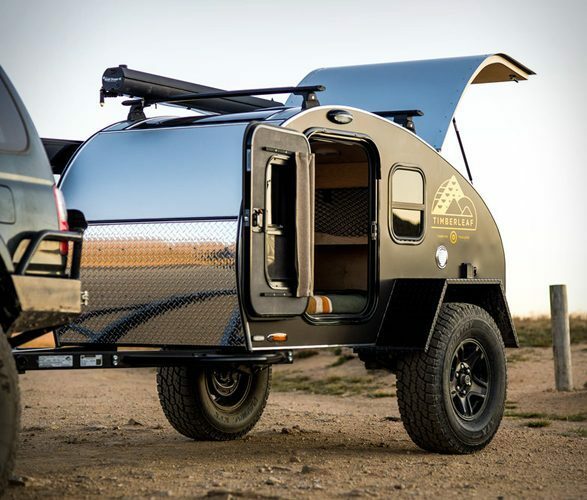 The second version of their small travel trailer is called the Apache, and it’s the largest model from Bear Teardrop Trailers. Combine it with one of our best camper vans and you’re suddenly looking at a serious off-road adventure rig that knows now boundaries! The Apache comes with a roof-top tent option that can take the total party up to 4-5 adults, and it’s perfect for small groups or families. The Apache can carry even more gear by using the built-in storage and roof rack. It comes pre-equipped with propane gas and has all of the necessary connectors to hook up to power if you’re in one place for a long time. The interior has shelving storage and an electrical panel, and the awning makes for the ultimate off grid outdoor party spot! 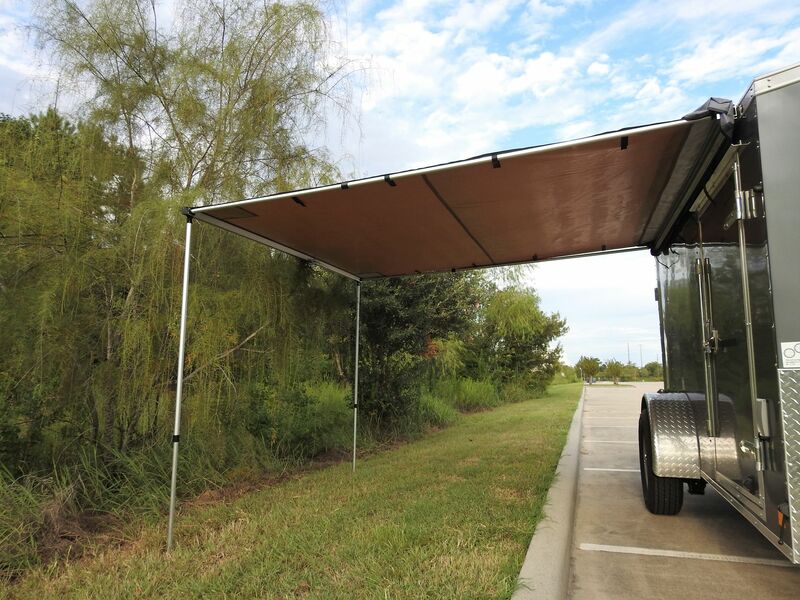 All of the Bear Teardrop Trailer models come with roof fans to keep you cool and to ventilate the living areas. They are also fitted with porch lights, a 4″ memory foam mattress and are ready for whatever upgrades you might want to throw their way. Choose from sun showers, heaters, rear hitches and awnings to turn your small travel trailers into luxury forest castles. The nice thing about the trailers is that they are ready to camp immediately; there’s not setting up or constructing to do once you arrive at your destination. So you have your perfect camper, but you need some extra space for your massive group of friends and all of your woodland pets and minions. You can’t sell your camper because you’re attached to it, almost like a loved one (but it’s a deeper bond), but what you can do with that loved one is buy it a new best friend, and that best friend is the Terradrop. 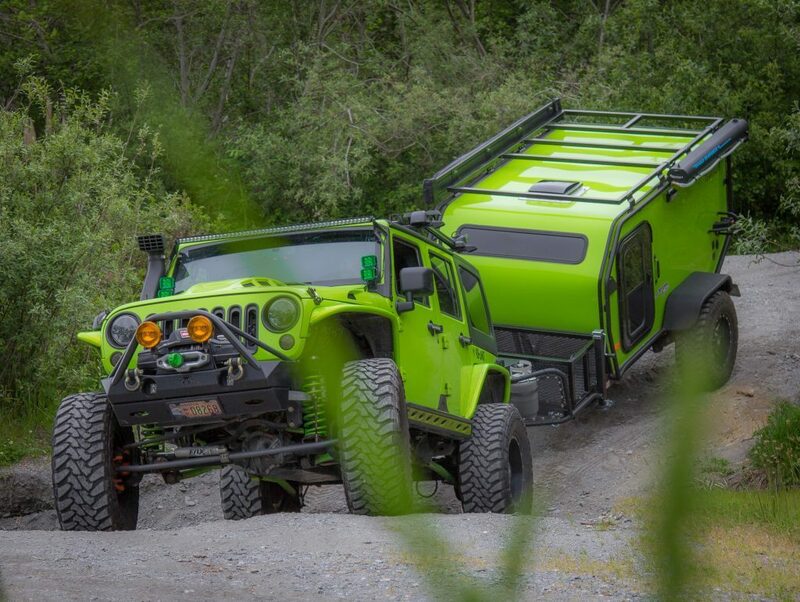 Oregon Trailer are the parents and creators of this off grid warrior, and they set out to provide it’s customers with an all new, all terrain, all singing-all dancing trailer that can not only take a beating and look like it jumped straight out of a commercial, but also give lots of additional space to it’s fellow adventure seekers and van lifers. 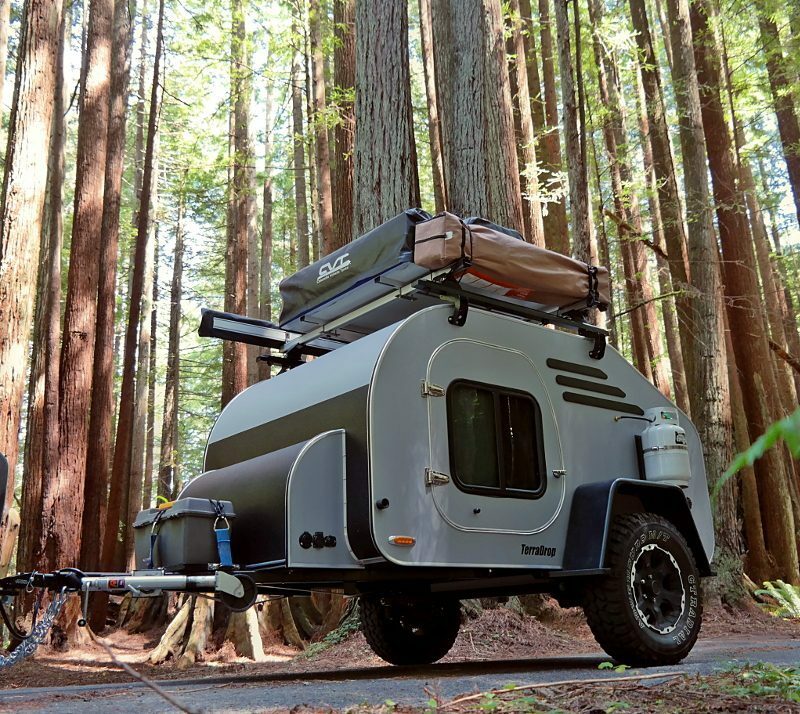 This tiny travel trailer is very reminiscent of an escape pod with it’s metallic silver paint job, tiny spaceship doors and huge off-road wheels that look like they could conquer the rocky craters of the moon. 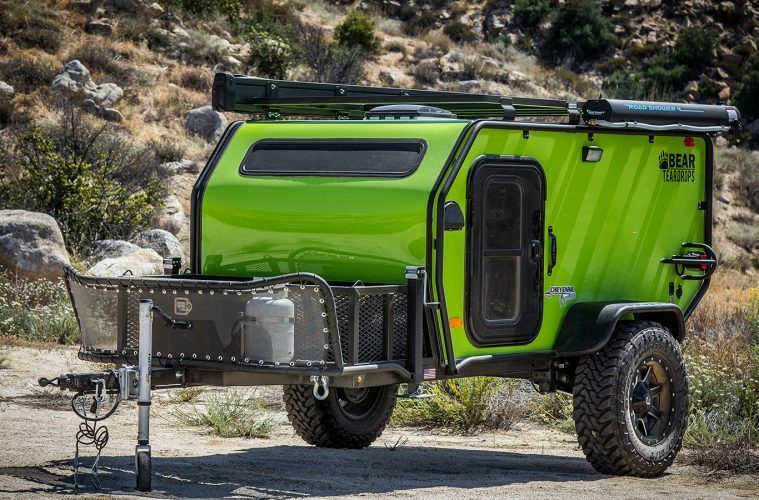 The Terradrop sits at a respectable 1200 pounds when weighed, which is a little heavier than some of the other small travel trailers in this list but not too much as to cause any upset. Up to 15% of its weight is distributed to the tongue of the trailer whilst towing, which means that you’ve got absolute control when you belt in to the drivers seat of your car or camper. At this point you might still be working out how terrifyingly big the Terradrop is. 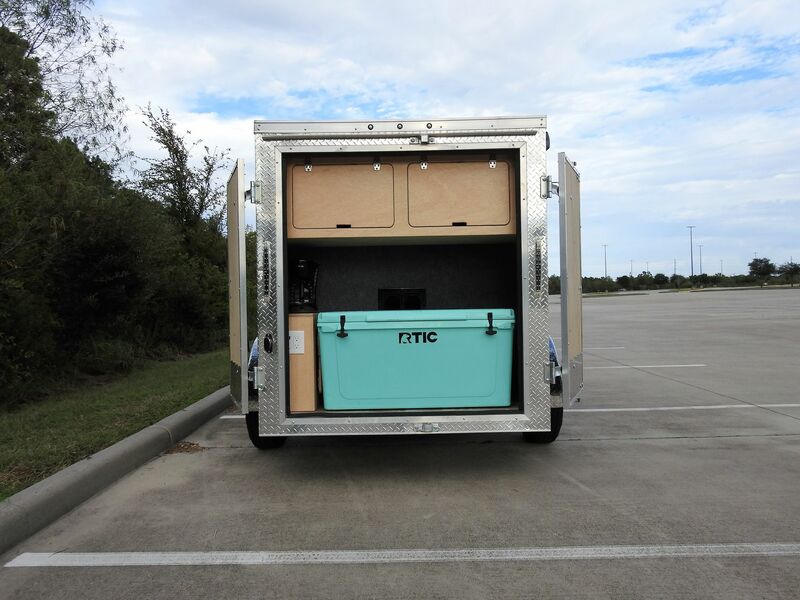 It comes in at 5 ft wide, 4 ft tall, 8 ft long – as small travel trailers go it’s not too big but has enough space and everything that you could need to be comfortable for a trip away into the wild. As with many of the other small travel trailers the Terradrop is functional and simplistic on the inside. 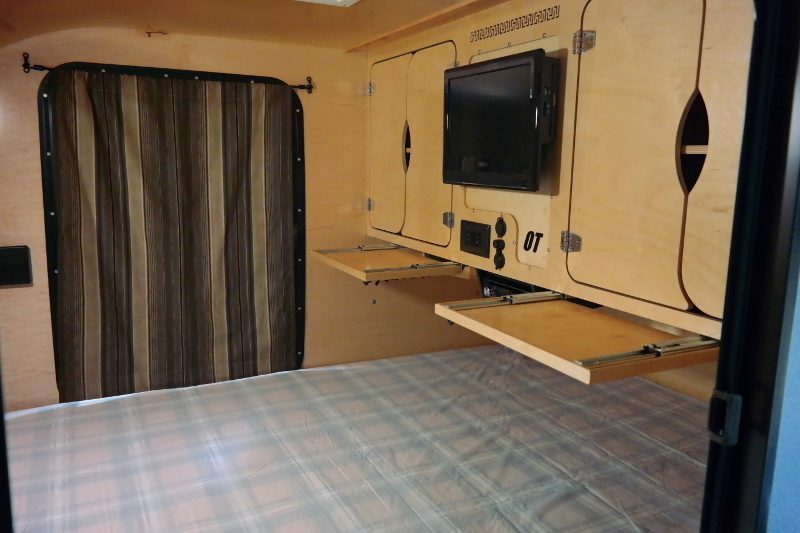 You have a comfy looking double bed, some useful internal compartments for storing your gear, an electric fan to keep you cool and to let in air through the course of the day, and large blacked out windows so you can relax in peace without nosy bears watching your every move. 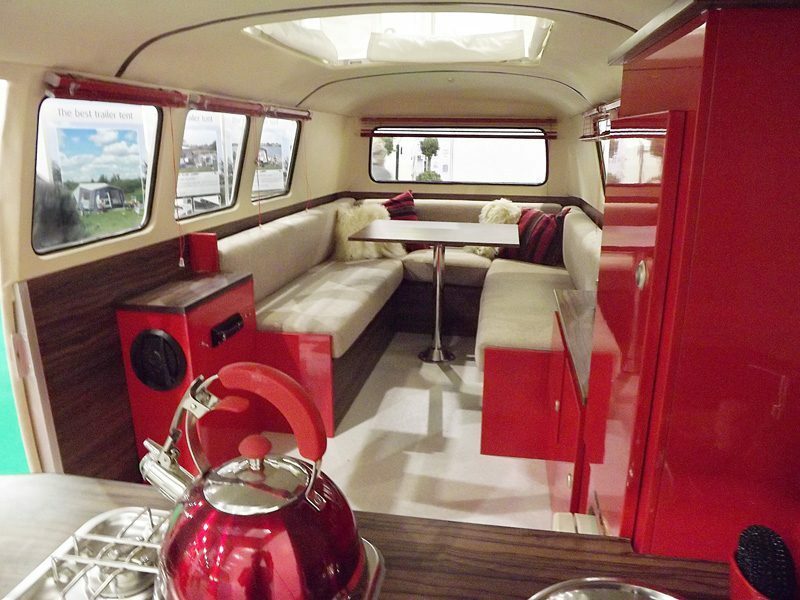 There’s tonnes of space for your outdoor equipment in the back, plus theres also a mini kitchenette area too! The Terradrop will cost you $15,000 earth dollars for the basic version, but the company will happily build you a custom plan and add additional extras that you think that you might need on the road. If you’re a fan of the Transformers comics and movies then you’ll love the pictures of the next addition in our small travel trailers list. Just like Bumblebee, this orange mechanical monster has some amazing tricks up its sleeve and it’s overall shape seems to twist and change with every new appendage that pops out – it’s by far one of the most awesome and bizarre trailers that we’ve seen in a very long time! 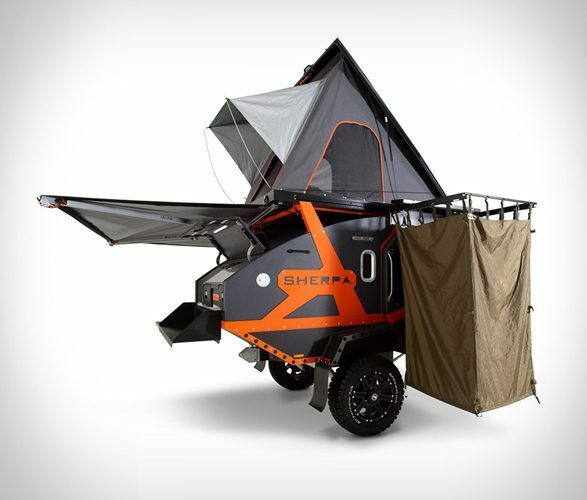 If you’ve been a long time reader, you’ll know that we love a good off road camper, and the Sherpa Trailer here is just that, but with more pow! 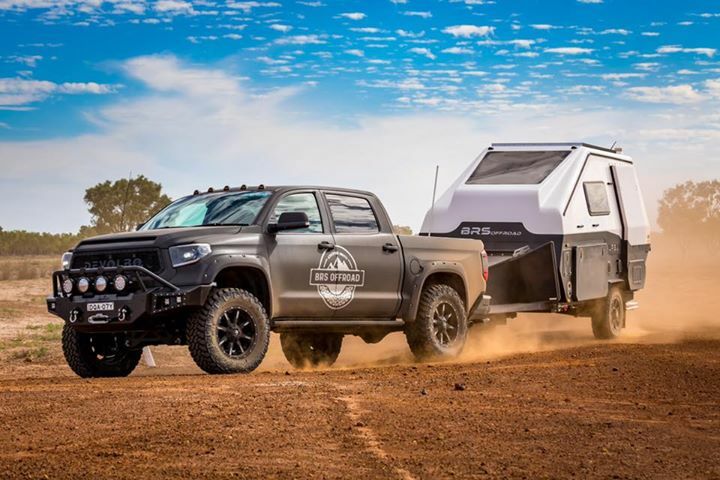 This series of small travel trailers were designed in Australia by a company called BRS Offload, a group of legends that specialise in creating off road behemoths that can tackle the toughest of terrains. Take it to the beach for a calm day or throw it around a mountain circuit – the Sherpa can handle any situation and still make it look effortless. First lets take a look at the gadgets outside the sherpa. 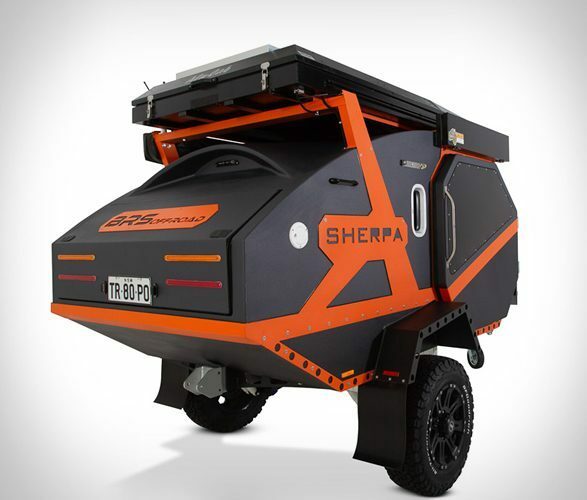 You’ll find a pop up Alucab roof tent on each of these small travel trailers, making The Sherpa an avid competitor in our top pop up campers list (not only is it a transformer, it’s a hybrid too!) The tent can give you an extra space to store some of your gear and provides an extra sleeping area for friends, family, children, or maybe your spouse if you’ve had a holiday argument. This pop top comes equipped with mosquito proof netting, resilient outlining and three windows, one with a rain stopper that opens to let you experience the full force of all the elements when you please. 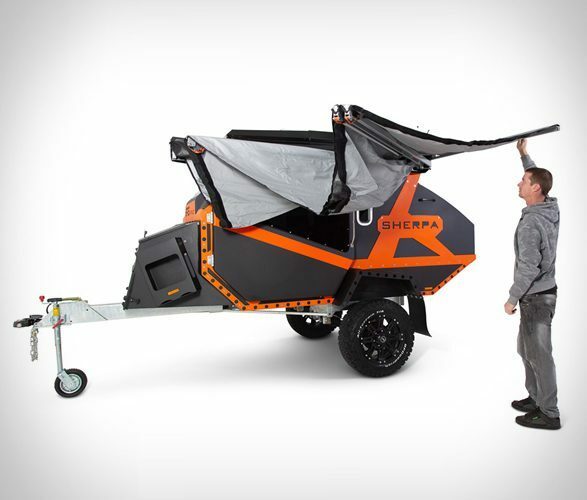 There’s also an extendable gazebo that pulls out and then wraps around half of the Sherpa trailer (we told you it was a transformer!) giving you 180 degrees of cover in sunny or rainy conditions. Towards the front you have a large window that allows you to gaze into the stars when camping and two entry doors that look a little like large mechanical ears; sorry if you’re listening, Sherpa. In our opinion the back of the Sherpa is where the real magic happens, and by magic we mean where the tasty food is made! These small travel trailers open up at the back to create an incredible off grid living kitchen area. The Sherpa offers ample fridge space with two 30l dometic fridges which will keep your snacks and chilled goods cool and fresh on the go. There’s a two burner hob that also folds out when you need it, a sink (bad news for the people that hate washing up) and oodles of storage space for your pots, pans, spices and sauces. The Sherpa also has an un-clipable outdoor shower curtain that drops down and covers your gems whilst you’re getting wild in the wild, because nobody wants to see those in the cold, and a bear might mistake them for…well you get the message. All you need to do is power up the diesel water heater and this will pump out of a handheld shower head so you can clean yourself, the kids, and your surfboards (and the bears if they’re still watching). Show Us Where The Gadgets Are! We’ll just like the other small travel trailers that we’re covered there isn’t much on the inside. There’s a 21″ LED TV for you to watch a bit of Netflix on the go, and a double bed for you and another camping buddy to slob out on and watch the day go by. There’s two easy to reach power outlets inside plus plenty of space for you to do your work on the go and hustle for a living. You can hook up with this small travel trailer, but an external solar panel could also keep you charged up on the go. 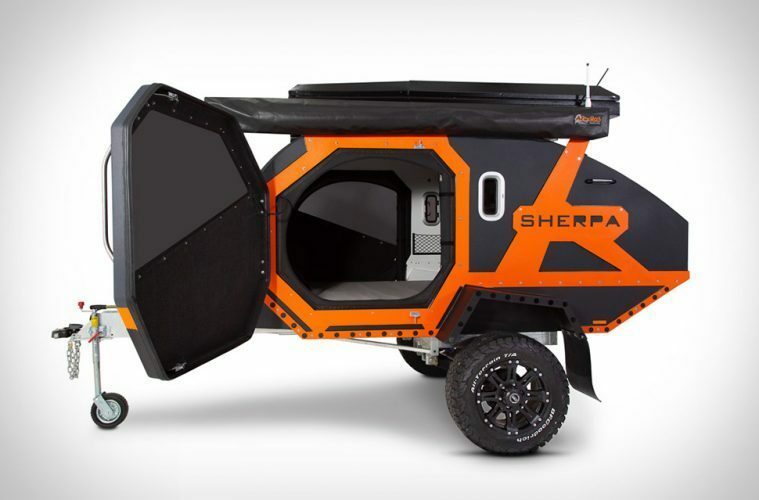 Apart from being one of the most crazy looking small travel trailers in our list, the Sherpa is one of the only trailers that can turn into a space age-gazebo toting-campground on wheels, and you know that we love anything that looks out of this world (we mention Star Wars often enough after all!) Unfortunately BS Off Road are keeping the price under wraps and only revealing it to customers who are interested, meaning it’s most likely a very large price, but once we know we’ll be sure to pass it on to you! Speaking of Star Wars, this next trailer looks equally at home in space as it does on the road. Imagine if a tie-fighter and the Death Star had babies…and then cloned them with an escape pod. Yeah, that pretty much sums this range of small travel trailers up. 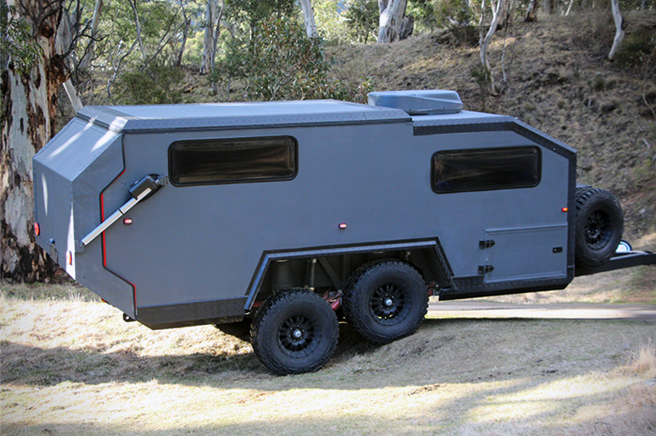 This is the Bruder Expedition Trailer, an off-road intergalactic monster for the off grid hero who likes a bit of luxury in his or her life. These small travel trailers boast tonnes of storage, a shower so that you can keep clean on the go, four beds for you and your friends (or just you if you like a change of scenery), an outside and inside kitchen so you can cook under the stars or stay inside out of the rain, hydraulics and a heck of a lot more! 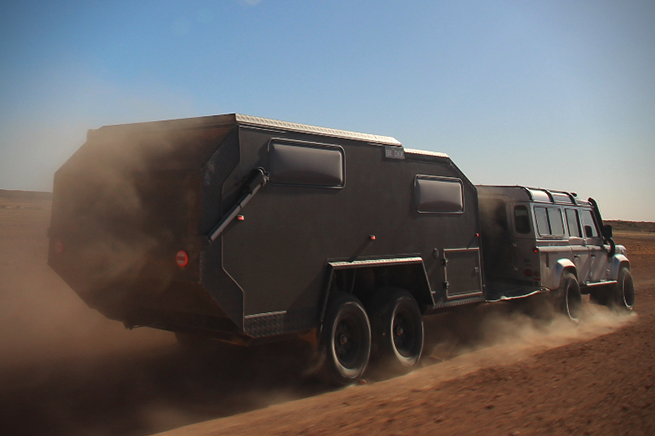 Bruner have basically made a small mobile apartment that can handle the apocalypse. You can conquer any terrain with the Bruder Expedition – just look at those tyres and at that suspension! If you’ve ever had a crazy dream of driving up Everest then I reckon this is the only trailer that could manage it! 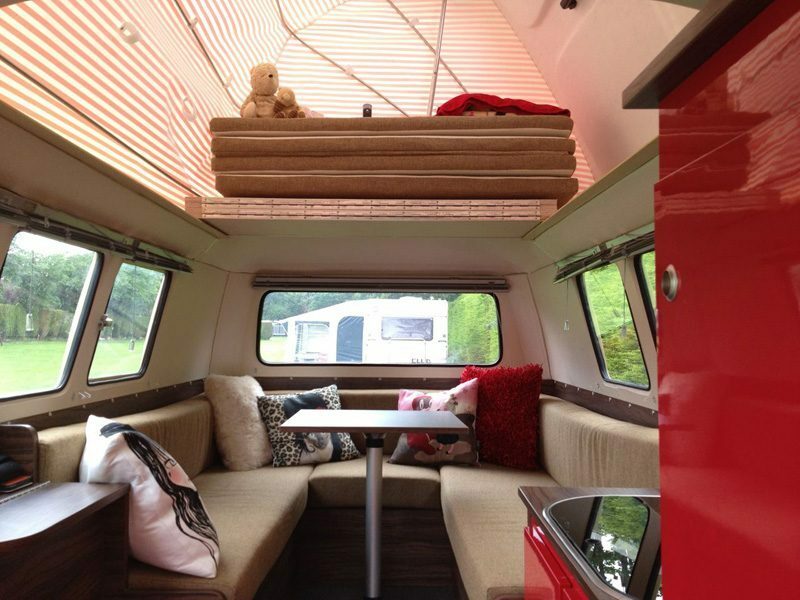 The interior is simple in design but has a luxury feel that you just don’t get from some of the smaller budget campers (namely the four beds!). There’s a place for your wine, fold out tables, widescreen TV, cupboards and air conditioning, and a whole load of other gadgets and gear to make your off grid adventure even more comfortable. Want to turn on the lights inside before you get in? These small travel trailers have touchscreens that can relay information back to your smartphone or tablet, so you can control the inside from the outside no matter where you are or what time of day it is! Yes, these small travel trailers can sync to your iPhone – who needs Siri now!There’s space for storage on the roof and a spare tyre slot for if the terrain proves to be a little bit on the sharp side (or if you happen to drive through a sea of glass). Prices are around five figures, but we think that you’ll agree that the video and photos do these small travel trailers justice. We’re huge fans of the ultra iconic Airstream Trailer here at Van Clan; it doesn’t matter whether it’s a millionaires mansion or the the humble 70s airstream conversion, we’ve spent many an hour looking at pictures of these awesome machines and planning how we’d convert our own. The leaders in towable metal houses have thrown a spanner in the works and brought out a brand new pimped-up upgrade to their Airstream Basecamp Trailer – now we’re totally unsure which small travel trailers we want in our lives! Small Living Never Felt So Big. Feast your eyes upon the upgraded Airstream Basecamp Trailer, which is now super charged with even more exciting and surprising add-ons that you wouldn’t think could fit inside such top eco campers. 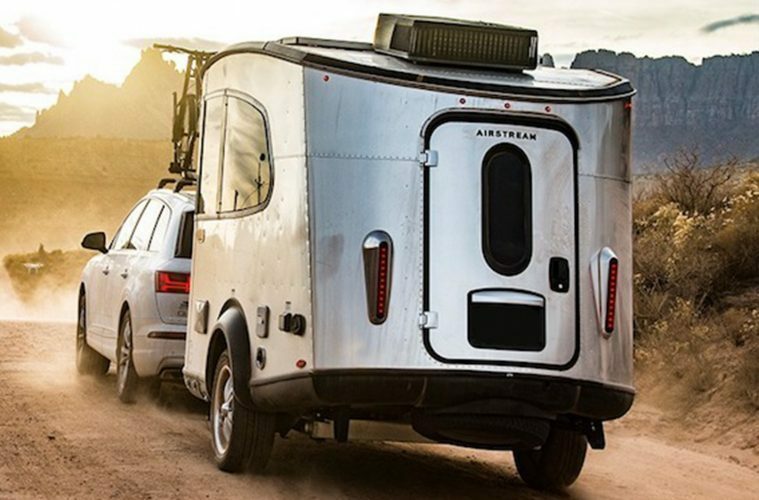 Airstream are on a mission to prove that good things come in small packages, and their message is certainly getting through! Some of the features that you’ll find in the standard Airstream Basecamp Trailer are a pre-wired solar kit so that you can save on those energy bills, a plethora (we love that word) of cleverly made storage solutions to hide all of your adventure gear out of sight, easy to reach USB charging points and a clickable technology dock, hot running water and cabin heating for cleansing showers and those cosy nights in, plus some seriously strong stabilising stacks to make sure that you don’t roll down a hill or flop over in a strong wind. What’s Inside Airstream’s New Range Of Small Travel Trailers? When someone says the word ‘Airstream’ you know that you’re going to be in for a comfortable ride. 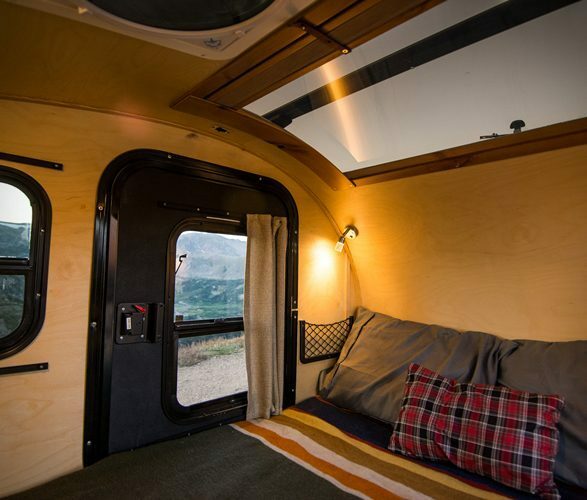 There’s tonnes of seating room in this towable tiny house, which means that you can really relax and spread out after you’ve got back off the trail, and theres ample air conditioning for those hot summer days and an eco heating system for those chilly winter nights. 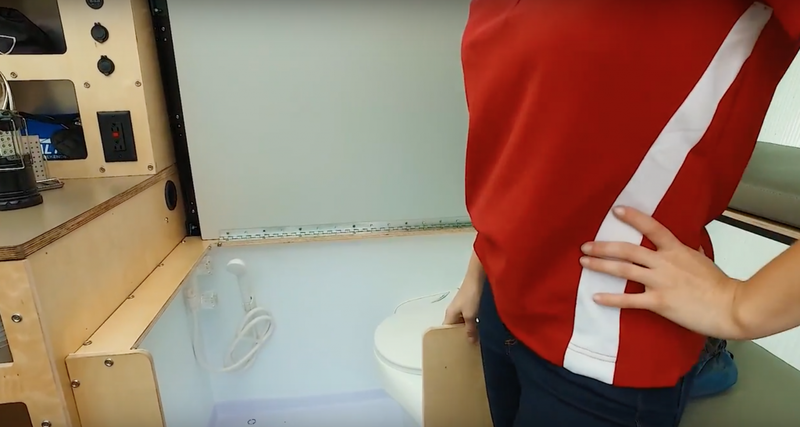 The Airstream Basecamp Trailer is one of the only small travel trailers that has a bathroom with a toilet and shower, plus it also has a clothes line so that you can dry your washing on the go (you might need the scrubba wash bag too!). 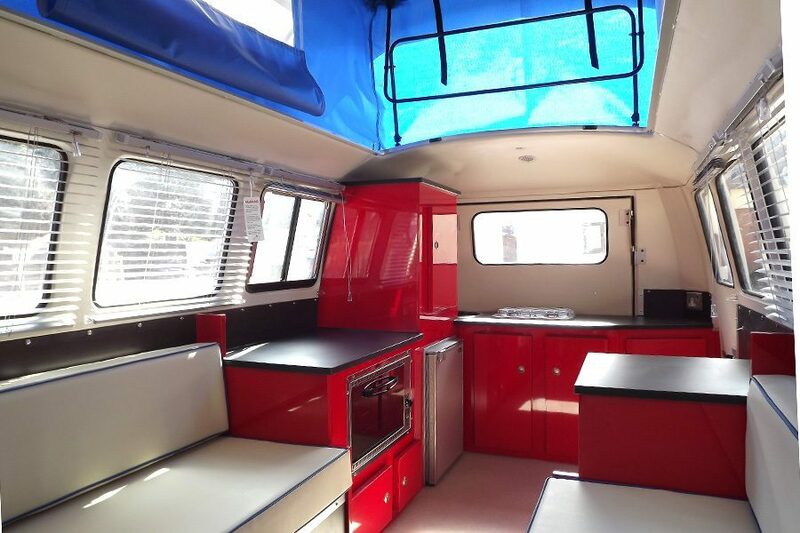 The Basecamp comes with some ultra useful blackout curtains in the bedroom and galley too, and it also has a 2 burner hob in the kitchen so that you can whip up some tasty treats using your top cooking accessories. The Basecamp Trailer can also be equipped with an an awning and extra roof top tents and accessories, plus with 126″ of useful storage space available inside the main cargo depth of these tiny travel trailers you’ll have no troubles getting to things that you’ve hidden out of site for a rainy day or items that are too bulky to stay in your living area 24/7. How Much Does The Airstream Basecamp Trailer Cost? This smaller and slighter sister to the iconic Airstream Trailer will cost you $39’600, and that includes all of the standard accessories that we’ve mentioned above. If you still feel like it’s missing something then you can add additional extras to the interior and exterior of these small travel trailers, but if you’re happy with the look and have your heart set on a mighty camper that can hold it’s own with the Volkswagen California XXL‘s and EarthRoamer‘s of this world then the Airstream Basecamp Trailer is definitely one of the small travel trailers that should be on your list. 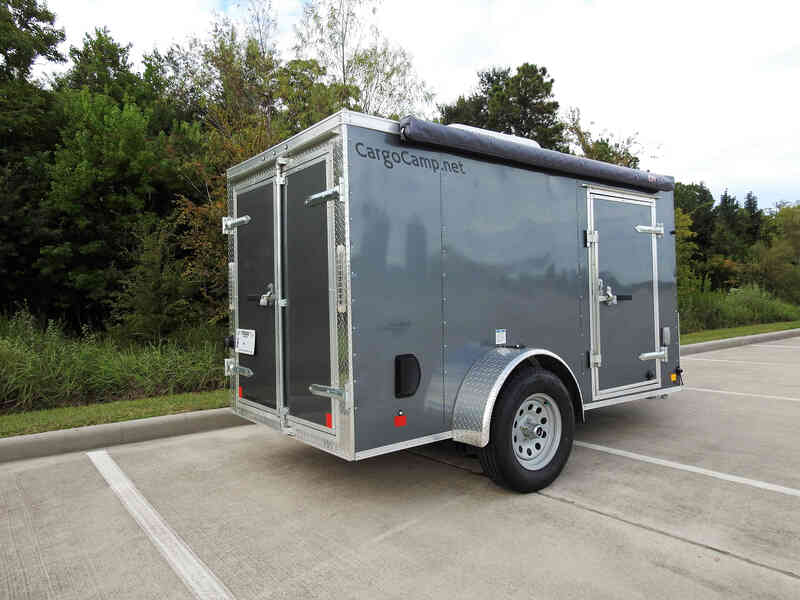 The price might be low and the camper might be light, but this trailer packs a serious punch! This trailer has everything including the kitchen sink. Are you the kind of thrill seeker that needs an outdoor kitchen and a wine holder? You’ve got it! 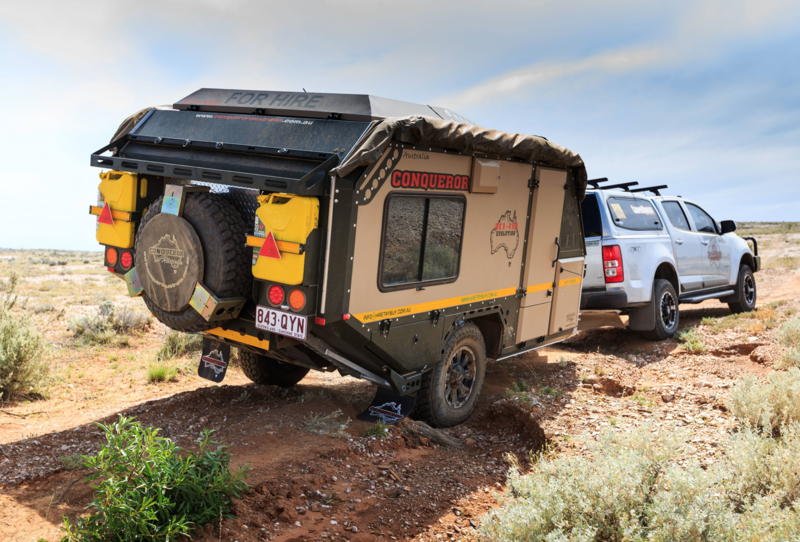 The Conqueror Overland Adventure Trailer series has everything that you could need to have a luxurious and action packed off grid adventure. 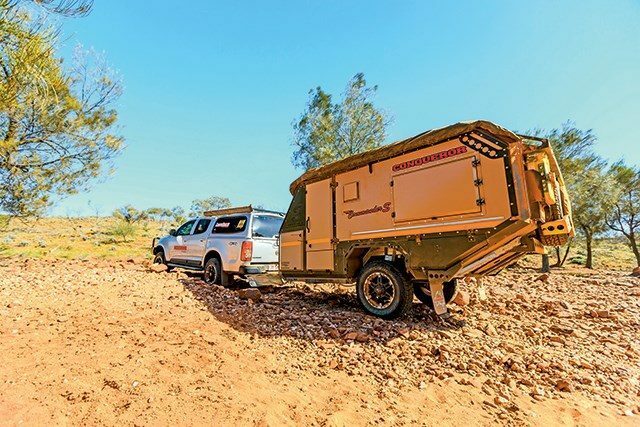 These small travel trailers have been tested in the outback and on safari for over 25 years, subjected to the harsh and unforgiving African and Australian wilderness. To cut a long story short they’re rugged, built to last and made to get a beating. Unlike some of the budget and smaller trailers that we’ve covered there’s no sign of any wood in this camper at all. Conqueror specifically avoid putting wood into their builds because they don’t want their small travel trailers to get damp and then rot. The main construction of the chassis is made out of bent steel instead, with other critical pieces made from thicker sheets that have been laser cut for extra precision. The inside living area might not be everybody’s cup of tea, but it’s built for comfort and functionality. 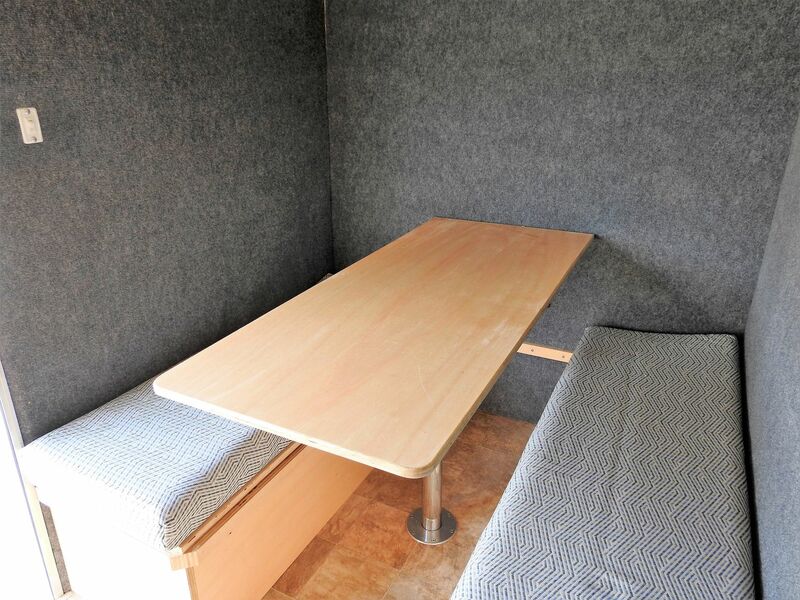 There’s a double bed up in the pop top sleeping area and a TV for those that like to really feel at home on the road. 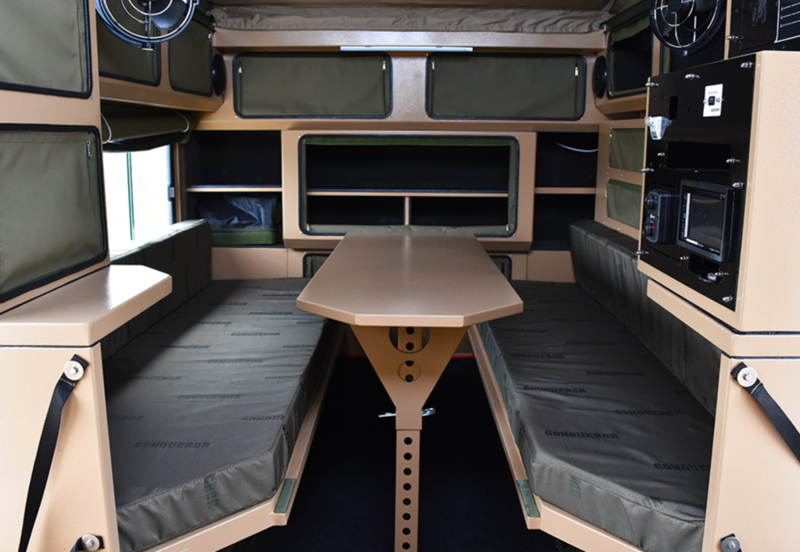 The interior of these small travel trailers definitely have a strong military theme, but if you’re going to be conquering the wild then it’s probably good to have a strong attitude like a general anyway! You’ll never be in a situation where you don’t have any power in the Conqueror Overland Adventure Trailer. 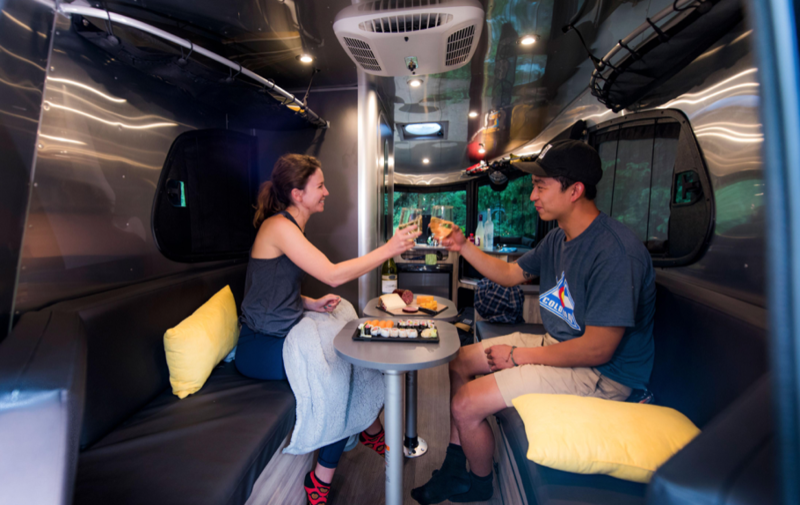 These small travel trailers come equipped with a Neutron 12 Intelligent Power Management system with Smart Phone apps-110v (which sounds like something that you’d find in the depths of the Starship Enterprise!) There’s 3 LED lights fitted inside, 2 Hella Plugs and 2 battery boxes with circuit breakers for extra safety. You can also add some solar panels to harness the power of the sun! With an onboard 130l water tank too you’re gonna have plenty of H2O for cooking and showering. 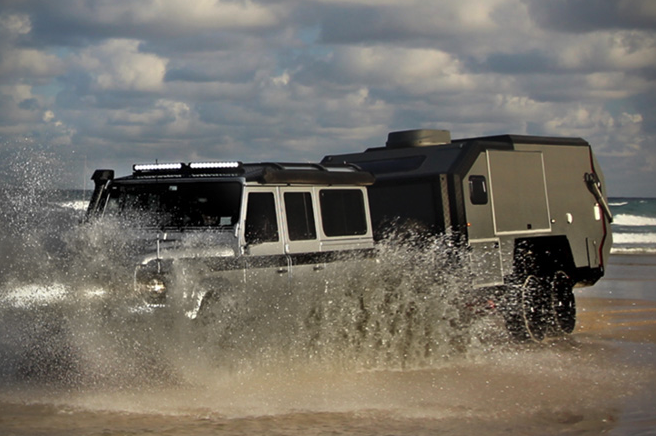 You can park the Conqueror Overland Adventure Trailer anywhere and everything is ready to roll. It’s easy to operate and set up, but it would be a little but inconvenient in wet and windy weather. It’s ok saying it’s been tried and tested in Africa and Australia, i.e two hot countries, but I’d like to see this do a stint in the Yorkshire Dales in the middle of the harsh UK winter to see how it holds up. The whole build is outdoors orientated and it makes you want to be out in the open a lot more. If you’re in a hot environment then everything that you could possibly need is there for you to live the nomadic lifestyle. 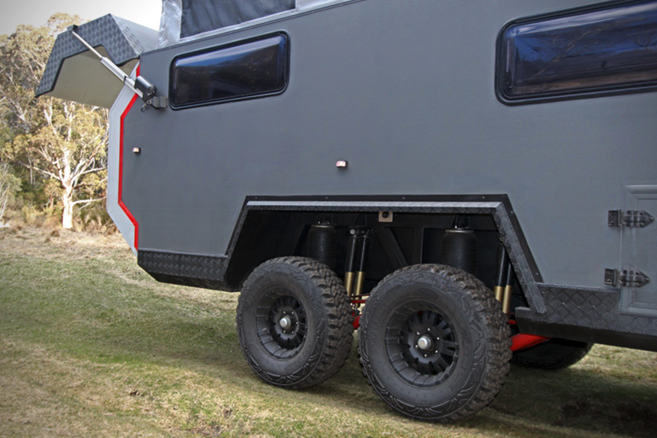 If you like sitting by a toasty coal fire then this might not be for you, but if you’re already in the market for gnarly small travel trailers then you can’t go wrong with the Megatron of all off road trailers. Want to learn more about Alternative Living? Check out this tiny house! Love the land and the sea? Check out the Caravanboat, you’ll be… impressed? If you’re filming on the road, you’ll need the Lumapod Tripod, it’s revolutionary.